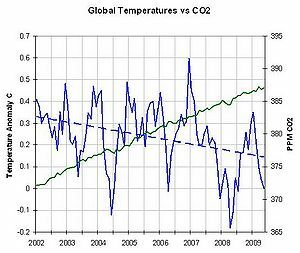 Despite an increase in atmospheric CO2, the earth has been cooling slightly for the past decade. Global warming is the theory that the earth is gradually warming up due to human influence. Unusual cold weather disproves the politically motivated claim by liberals that the Earth is rapidly warming. Liberal bias is severe for this issue: the lamestream media are far more likely to report on unusually hot weather than unusually cold weather. When there is strikingly cold weather, the lamestream media headlines distort the truth by calling it "nasty" or "severe", rather than "very cold." About as many snowfalls have occurred in Florida in the past 10 years as in the 100 years before that. Prior to Thanksgiving 2013, a snowstorm ravaged the southwest and Texas, while temperatures in the northeast were about 15 degrees below normal. In January 2014, "the Midwest shivered through the region's lowest temperatures in two decades." In the first half of 2011, West Coast temperature have been consistently running at least 10-15 degrees below normal. Many have theorized that this is God sending a message to liberals. In Truckee-Tahoe in the second half of June 2011, every day the temperatures have been colder than normal, often nearly 30 degrees below average. Though unreported by the lamestream media, temperatures in New Jersey at the beginning of July 2011 are about ten degrees below normal. In January 2010, "coldest weather in 12 years hits North Texas." In early February 2011, snow and ice pummeled Dallas and Houston, Texas, in a nearly unprecedented fashion. February 2010, 241-mile Lake Erie was completely frozen over for the first time in 14 years. Lake Michigan had not frozen over since the 1970s until ... 2009, when it froze over, and then again in 2010 and 2011. New York City had its sixth-largest snowstorm ever on the day after Christmas in 2010, and the liberals in charge were unprepared. In February 2011, some parts of San Francisco witnessed snow, though it was too little to count for an official measurement. San Francisco has not witnessed a recordable snow fall since 1976. Meteorologists did a thirty-year study of California forecast data. 75% of measurement sites saw a reduction in temperatures. In late October 2011, a Northeaster dumps 2+ feet of snow in much of the region, and leaves over 3 million people without power. In January 2014, a huge storm dropped over two feet of snow in some parts of the Northeast, while record low temperatures occurred in other parts of the country. Just a couple of weeks later, another storm dumped over a foot of snow over the same region. In spite of predictions, 2011 is shaping up to be a cold year for Australia. It saw the coldest day on record for the east, the coldest June on record in the west, the coldest May on record in the north, only *almost* record breaking in the middle of the country, likewise for the south and nationally it was the coldest Autumn on record, ever. But, but, but global warming! Maybe the west should burn more fossil fuels to heat things up? Or maybe they can use the hot air coming out of Al Gore's mouth? Even SMH, a notoriously Liberal men's magazine, is asking "Where's my Global Warming, Dude?". The North-Western part of the European continent had an unusually cold November and December in 2010, leaving even the most convinced "global warming" believer to ask "If everything is heating up and we're all going to die in a matter of a few years, why have these months been so cold!?" The global-warming alarmist "answer": "It's hotter, therefore it's colder. No really!" In February 2012, temperatures in Eastern Europe reached below -22 F. "Blizzards and the bone-chilling cold have resulted in the deaths of over 550 people so far, with rooftop-high snow drifts trapping tens of thousands of villagers in their homes and cutting off access to entire towns. It has even snowed as far south as North Africa." Cold waves in Peru are so bad they have to issue safety warnings about them. Tom Rowan from the American Thinker asks, will 2011 be the year without Summer? Thirty-two inches of snow fell on the driest place on earth, the Atacama Desert in Chile. They record less than 50mm of rain per year, 80 cm of snow July 2011. Delhi has been hit by thick fog during the winter of 2011 which disrupted flights, closed schools and killed dozens of people, proving that even the Indian subcontinent is not immune to the cold wave sweeping over the globe for 2011. Even the BBC, a liberal media bastion, is showing the pictures for all to see. Is even the mainstream media abandoning "global warming", or is the evidence too much for them to sweep under the rug any more? Meanwhile, the communist and atheist nation of North Korea (known as The Democratic People’s Republic of Korea) is freezing their little Atheist toes off. The cold is so bad that the river that bisects Pyongyang has frozen over. The cold appears to be universal, among industrial and non-industrial nations alike. Is it really carbon causing these events? And why are there no answers from the "global warming" community about the obvious inconsistencies in their theories? In Mexico the unseasonably cold weather has caused significant destruction of crops in early February 2011. If it's so cold that corn can't survive, why do people keep claiming the planet is warming up? A severe cold was expected by Dr. Ryan N. Maue to hit Russia in February 2011. The famous Russian cold defeated Napoleon's armies, perhaps it will defeat the armies of Al Gore too? Chaos in China as a cold snap there freezes over the highways, raises food price and causes Atheistic toes to curl. Is there any part of the world actually affected by global warming? Going simply by the law of averages, at least *somewhere* must be getting warmer. Warm weather patterns are fully expected in the absence of global warming. With global warming we wouldn't expect cold weather patterns, because the earth would be warmer. In one week in July 2011, approx 700 high temperature and 2000 high minimum temperature records are shattered in a heatwave that blankets the entire MidWest and East Coast. However, this also happened alongside a massive cold streak during the winter, so it is not a legitimate sign of Global Warming, and the heat wave is relatively short in duration. Little Rock, Arkansas, and 14 other cities and towns break their all-time record high temperature records, and Texas temperature records look set to be shattered in a summer heatwave that is sitting over the South in the summer of 2011. "I can't remember any year with the magnitude and length of this heat wave," Jack Hayes, director of the National Weather Service said. Texas drought is worst in a century, and extending to other Mid-Western States. As of July 6, 2012, 23,283 daily high temperature records have been set in 2012, up 71% compared to the same period in 2011. In spite of record cold and snowfall in the U.S., January 2014 was still globally one of the warmest Januaries in history. Random temperature fluctuations, including those above, would occur in the absence of global warming. Although Global warming should be causing massive droughts, massive flooding along the Mississippi river in 2011 has resulted in many deaths as well as billions in property damage. Often, when a climate conference is held, a new record low temperature is set for that location. Maybe God is trying to send the alarmists a message? In light of the global cold snap all around the world, perhaps the message extends beyond Al Gore? During the Cancun climate conference, record low temperatures in the low 50s were set on three consecutive days.